Five to ten percent of the 3.5 million homeless people in america have dogs or cats. Thats roughly 350,000 pet owners that have trouble feeding & getting the correct care for their animals, and themselves. Here at real good we aren't only about real good toys, real good eats, and real good sleeps. we like giving back. every time you shop with us you are giving back to a pet that belongs to one of these homeless americans. now ain't that, real good? Founder, Terah Gisolo: West Texas raised, rooted in Los Angeles and never without (wo)man’s best friend! After spending her entire life surrounded by Dogs, Terah Gisolo was introduced to the world of rescue by her sister, who has adopted more Dogs than can be counted. All were in their last hours in the shelter or left for dead. Inspired by Dogs in need, Terah dedicated years volunteering for numerous rescue groups coast-to-coast and has fostered countless Dogs. Her obsession and passion for Dogs has only picked up momentum over the years. Thus, Real Good was born. 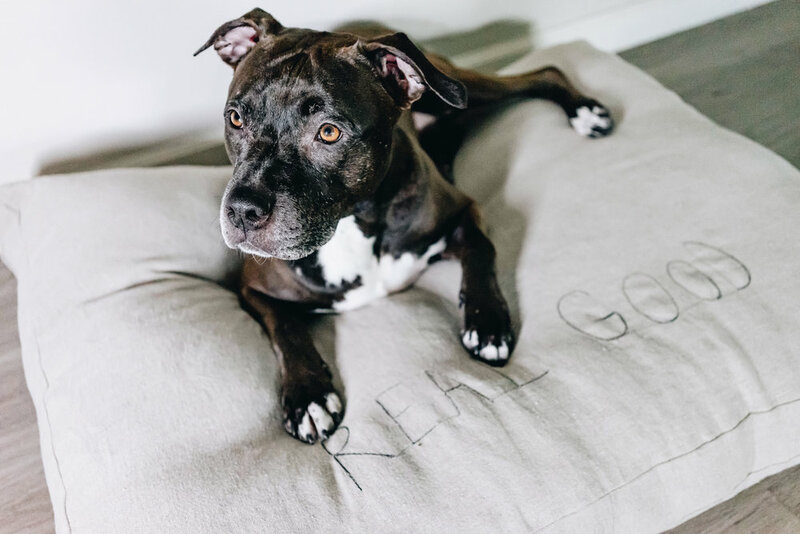 Real Good is all about the Dogs. Our intention is to educate and provide awareness to end the abuse of Dogs; to ensure all Dogs live in a loving home rather than in a shelter or on the streets. We hope to empower individuals to feel confident about adopting a Dog from a shelter or rescue group just as they would when buying from a breeder (which we poo poo on). We aim to eliminate the unfavorable stigmas surrounding specific “Bully” breeds. The method to our madness: when you shop from Real Good, your dollars make a difference. We will donate 11% of the profits of each purchase to the animal companions of our homeless brothers and sisters. After all, your financial support is a vast part in giving the animal companions of our homeless brothers and sisters, the care and support that they need. We mean it when we say we love Dogs for real and we want to use our love of Dogs for something, well, Real Good. In case you’re still wondering, any friend of a Dog is a friend of ours! Thank you for your support and helping us save lives!